The Intermediate Division includes Grades 6-8. Grades 6 through 8 are important years, where our boys take on increased leadership roles and pursue further specialized studies. Boys hone their learning skills and work habits to prepare them for their future education in secondary school, as well as continuing personal growth. Our Intermediate model includes homerooms, rotary subjects and elective courses to help foster independent learning. A strong emphasis is placed on the executive function skills of organization, self-advocacy, study skills and planning ahead. The core subjects of math and English/language arts are taught in an integrated approach with social science and science giving students the opportunity to connect with knowledge from a variety of angles. Content strands in mathematics include numbers and operations, algebra, geometry, measurement, data analysis and probability. English exposes boys to numerous forms of poetry and prose and they are encouraged to explore forms of writing within each. Specialized instruction in art, French, music and physical education continues. Grade 7 and 8 students study philosophy, a subject that is rarely taught elsewhere before secondary school. 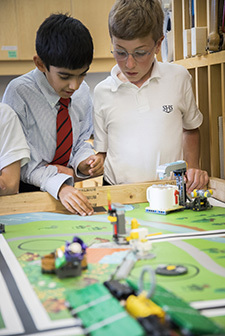 Boys develop their interests by choosing an elective, such as debating or woodworking, which they study in small groups made up of boys from Grades 6, 7 and 8. This intermingling of grades provides leadership and mentoring opportunities for the older boys and wonderful opportunities for younger boys to learn from those who have been in their shoes. Students participate in several exciting trips that build and challenge their leadership skills. Grade 6 and 7 boys visit an outdoor education centre, while Grade 8 boys enjoy an eight-day wilderness canoe trip in Temagami. In addition, there are curricular trips for each of the grades (Grade 6: Ottawa, Grade 7: Quebec City and Grade 8: Washington, D.C.). 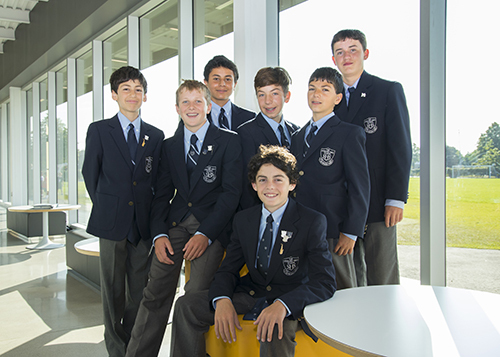 Every Grade 8 boy has a key leadership role in student initiatives related to academics, arts, athletics, environment, communication, citizenship or the House system. Grade 7 students are school ambassadors, and boys in Grade 6 through Grade 8 help younger students in our Peer Teaching programs. To help the boys prepare for secondary school - and to provide support in other areas as needed - each Grade 8 student chooses a faculty mentor. Our mentorship program is an outstanding opportunity to help students navigate their senior year and make the transition easier into the exciting years ahead.